The British electronic duo Autechre appears to have uploaded some 444 videos to YouTube over the course of 2018, beginning in January. As such a sentence is often followed up: evidence surfaced to this effect on the Autechre board at Reddit in the past day. The full playing time is in excess of 13 hours. There are also discussions going on at watmm.com, a forum focusing in large part on artists from the Warp record label, home to both Autechre and Aphex Twin, among others. Each video displays an array of colors going through some sort of transformation, accompanied by a rush of fomenting drones. There appears to be a strong correlation between sound and image, suggesting there is a direct connection, perhaps the images and sounds sharing a single source, or one being the impetus for the other. All the images seem to be reflectively bisected at the horizontal midpoint. The result brings to mind a neural network’s combination of Hiroshi Sugimoto’s horizon-view ocean photography and Brian Eno’s colorful light installations. As is the case with many an internet Easter Egg hunt, the communal scrambling to make sense of the ambiguous material is reminiscent of the mysterious Russian video footage at the heart of William Gibson’s 2003 novel, Pattern Recognition. A substantial number of the 444 Autechre videos are brief, under a minute, though some are quite longer. Of the first ten, all but two are under a minute. However, continue deeper into the playlist mix and number 24, the longest in the set, is 7:10. One of the Reddit members posted a “Handy Dandy Sortable” Google spreadsheet, which among other things helps identify that of the 444 videos, 278 have a running time of a minute or longer. The expansive playlist caps a busy year for Autechre, which consists of Rob Brown and Sean Booth. They released a massive box set, NTS Sessions 1-4, collecting an online residency they produced in April, and earlier this week shared production files of their own making for various pieces of widely used musical technology from the companies Elektron, Nord, and Akai (see: factmag.com). Major thanks to Matt Nish-Lapidus for having drawn my attention to it. View the playlist at the hidden YouTube channel. 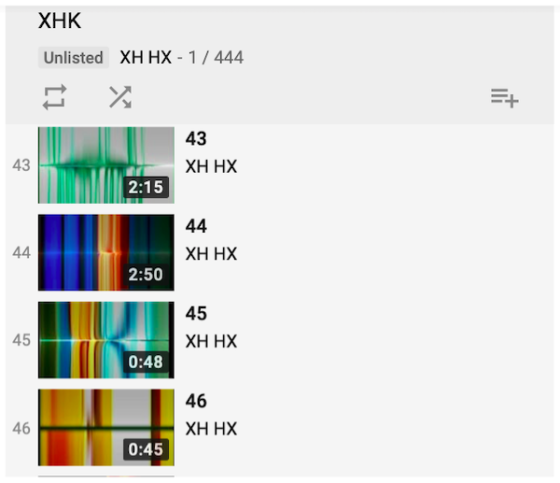 Interestingly, if you back up from the playlist to the account, attributed not to Autechre but to XH HX, none of the material, neither the videos nor the playlist, are viewable. Updates: (1) Additional thread at watmm.com, focusing on the visuals in the context of other “ae_store eastre egg” (ae being a common shorthand for Autechre). (2) A website, 444.frm.space/scans, of scans from the 444 videos. Updates: (3) I am reminded that “444” was the title of the final track off Incunabula, the Autechre album released in November 1993, or 25 years ago this month.